Our commitment is to put the CUSTOMER FIRST in everything that we do. For your reference, click here to view our turnaround times (TAT) for various life policy transactions. We have prepared the following Frequently Asked Questions (FAQs) to answer your most common policy inquiries. Click on any of the following categories related to your inquiry. How do I get a MyAXA account? All AXA policyholders can have a MyAXA account. You can register at www.axa.com.ph and access your account online via web or mobile app. How do I install the MyAXA App? 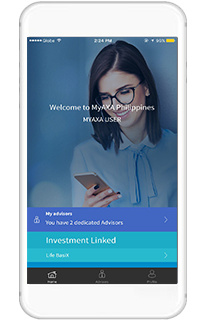 Simply download the MyAXA App from the Google Play Store for Android and App Store for iOS. Once installed, you may register using the email address on your policy records. What are the transactions I can do using MyAXA? You can view your basic policy details, account values, official receipts and even contact your distributors directly through your MyAXA account. How do I view my official receipt using MyAXA? Go to Policy List view and select policy. Scroll down and choose “MY DOCUMENTS”. Under this tab, select Official Receipt and you will be able to access all the official receipts from your previous payments. Can I print a copy of my official receipt? 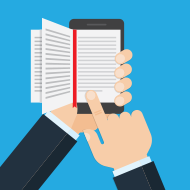 Yes, you may print a copy of your official receipt as long as you have a PDF viewer installed on your device. You may also share a copy of your official receipt through email by installing an electronic mail messaging app on your device. Is MyAXA Mobile App available for download in other countries? MyAXA Mobile App can be accessed through Android Phone (Android 4.2 Jellybean) or Apple (iOS 8) phone. If I have multiple AXA policies, do I need to register each policy in MyAXA? You only need to register once. 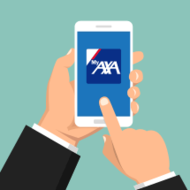 Once registered, all policies will be reflected in your myAXA account for as long as the email address in the policy records are the same in AXA's database. How come some of my policies are not reflected on my MyAXA Account? To ensure that all your policies are reflected under one account, make sure that email address on record for all your policies are the same. You may verify and update your policy’s email information on through your distributor or you may chat with us through our website www.axa.com.ph, email us at customer.service@axa.com.ph or call us at (02) 5815-AXA. How do I apply for a new insurance policy? To start your policy application, download the New Business Pre-Submission Checklist available at our website, complete the necessary documents and submit through your Financial Partner (Financial Partner details are available on your MyAXA account). For new customers, you may set an appointment to meet with a Financial Partner by choosing from our list of Financial Partners through MyAXA Partner or visit any AXA or Metrobank branch nationwide. You will receive an SMS notification informing you of the status of your application. The turn-around-time for processing of policy application is two (2) working days, if documents are complete and there are no additional requirements needed based on initial assessment. The Cooling-off Period* is 15 days starting from the day you or your representative receive the policy contract. During this period, you may still surrender the policy by submitting a signed letter of request together with your policy contract directly at our Head Office, and all charges will be returned. The amount from the investment fund/s that will be returned will be based on the actual value of the chosen funds on the valuation date for each fund immediately following your request to surrender the policy. Thus, the released amount is not necessarily the same as the initial premium paid. 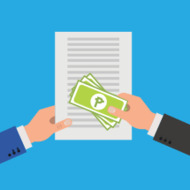 How will I receive my policy contract? Your policy contract will be delivered to your mailing address within 10 business days from the date of issuance of your policy. You will receive an SMS notification once your policy has been issued, and a separate notification for the delivery of your policy contract. A variable life insurance product provides both life protection and potential upsides from investment funds. The performance of the funds (and hence the value of your investment) nay go up or down, depending on the prevailing market condition. Is it possible to change the funds where my money is invested? Yes, unless otherwise stated in your policy, you may switch funds or change your fund allocation as your needs and investment goals change. What is Cost of Insurance? COI is the charge for providing insurance coverage including coverage for Riders, as determined in accordance with the policy contract’s COI Provision. COI is based on the Insured’s attained age and other insurance factors. How is Cost of Insurance deducted from my Account Value? COI is charged monthly on the same day of the month as your policy’s Effective Date. It is charged by cancelling Fund Units equivalent to the COI from your policy’s outstanding Fund Units. Fund Units ar cancelled based on your policy’s weighted average of units. 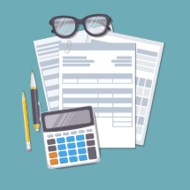 What deductions are made on my payments and account value? · A one-time premium charged upfront is currently fixed at P4,000 for ambition X; US$80 for Dollar ambition X; top-up charges are waived. For 3GX, premium charge follows a tiered rate of up to a maximum of 5% of the single premium. Top-up premium transactions are not applicable for 3GX. · Asset Management Charge (AMC) varies based on the type of your chosen investment fund. The unit price published by AXA Philippines is net of the AMC. · COI, based on your age and other insurance factors, is deducted monthly from your investment fund/s. · Surrender Charge varies based on the type of product purchased and is deducted monthly from the proceeds of the policy. This applies when your policy is pre-terminated or surrendered earlier than expected. · Premium Charge is 35% of your annual premium, charged for the first three (3) years if the product you purchased is aXelerator or academiX; and charged for the first five (5) years if the policy you purchased is Life BasiX. A 2% Premium Charge will also be deducted from all top-ups made. · COI, based on your age and other insurance factors, is deducted monthly from your investment fund. · Surrender Charges are applicable only for the first five (5) policy years of both aXelerator and life basiX. Charges are deducted from the proceeds of the policy upon pre-termination or surrender earlier than expected. 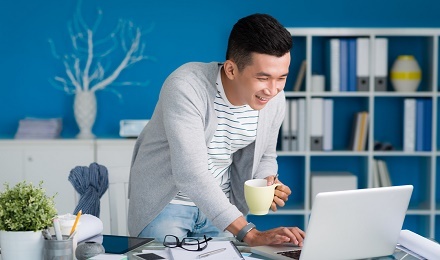 How can I keep my regular-pay policy inforce? Your policy will remain in-force as long as you pay your premium on or before the due date, or as long as your account value is sufficient to cover the amount of premium and relevant charges when you elect for a premium holiday. If I cannot reinstate my policy within three (3) years from premium default, can I still get financial protection from AXA? If your policy can no longer be reinstated, you may apply for a new policy. This website has a list of different AXA products you may choose from. How much is the death benefit under my policy? (2) The death benefit option you have chosen as indicated in your application form. What interest do beneficiaries have on my policy? Beneficiaries are the persons designated to receive the proceeds of the policy upon death of the insured. If you designated a beneficiary as “irrevocable”, then his/her consent is necessary before you can exercise any right and privilege (such as policy loans, change in beneficiary, policy assignment) under this policy. How can I update my policy information? You may fill out a Request for Policy Amendment Form which may be obtained from the AXA website. You will receive notification from us sent to your designated mailing address once we have updated your information in our records. If you need to update your contact details alone, however, you may download the MyAXA app and update it from there. Assured must inform any changes of the policy details to his/her handler and provide the reason for amendment. You may also email the policy number, assured name, type of policy and the updated details to customer.service@axa.com.ph. Please note that some amendments may require additional documents. How do I renew my non-life policy contract? You may contact your agent or your nearest AXA branch to obtain a renewal quotation via call or email. You may also email the existing policy number, updated contact information to customer.service@axa.com.ph and we will endorse your request to your handler. • You may enroll your premium payments via Auto debit Arrangement (ADA) if you are an accountholder of Metrobank, BPI, BDO, Chanabank, PNB and Landbank. 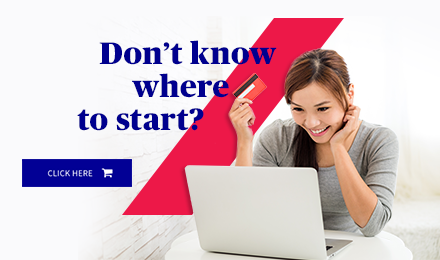 Simply download and accomplish the specific bank form from our website www.axa.com.ph and submit the duly accomplished original copy of the form at any AXA office or through your distributor. For Landbank accountholders, forms should be accomplished in duplicate & validated at the branch of account prior to submission. With a network of 63 banks, pay with your ATM/Debit Cards using our Point-of-Sale (POS) terminals in our AXA Head Office, Binondo-Wellington, Cebu and Davao branches. Check payments must be payable to “AXA Philippines”. Make sure to indicate your policy number at the back of the check, and submit to the AXA Head Office or to any of our branches. There is a 31-day grace period after your premium due date during which your policy shall remain in effect even if payment is yet to be made. If your premium remains unpaid after the grace period, and the amount in your investment fund is not enough to cover the necessary charges, your policy will lapse and the benefits will no longer be payable to you. Necessary charges have been fully paid. 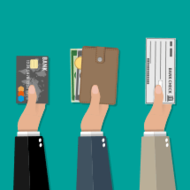 What are the reasons for unsuccessful auto-debit/ credit card charging of premiums? Contact your bank immediately and pay your premium over-the-counter until new payment details have been provided. What does "Basic Sum Insured" and "Sum Insured" mean? The Basic Sum Insured, as shown in the policy specifications page of your policy, is the amount used to determine the insured’s risk class (standard or special) at the time your policy was applied. Your Sum Insured is equivalent to the Death Benefit the beneficiaries will receive at time of the Insured’s death. Can I make additional payments or top-ups to increase my account value? Unless otherwise stated in your policy, you make top-ups anytime while your policy is in effect. Top-Ups are additional cash or money that you can make in addition to your premium payments, and are used to buy units in the investment fund/s of your choice. How often will the value of my investment be reported? The performance of AXA’s investment funds, with the exception of the Global Advantage Fund and Armor Fund*, is assessed every working day. This is referred to as the “valuation date”. You may visit this website for the updated fund values or refer to the rates published every Thursday in leading newspapers. 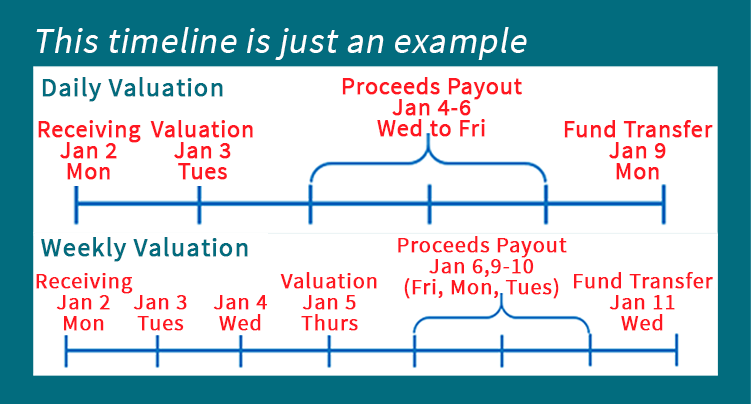 “Forward pricing” or using the date of the next valuation unit price as reference, is followed for all funds. What are the cut-off times for a transaction to be included in the next valuation date? AXA follows a forward pricing in determining fund values. Thus, it is important for you to know and remember the transaction cut-off times in order to refer to the correct unit price that will be used in assessing your policy fund values. Daily cut-off time is Close of Business (COB) at 5:00PM. 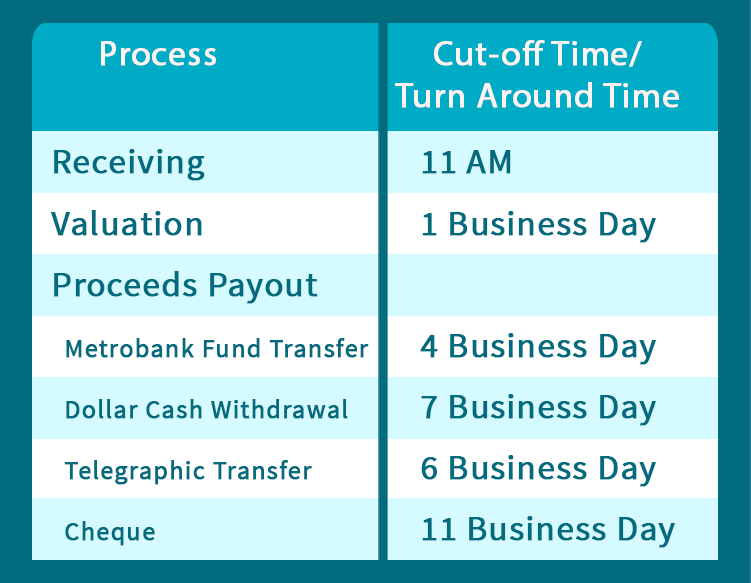 Transactions must be completed on or before 11:00AM to meet the next working day’s (T+1) valuation. Except for New Business, transactions that do not meet the 11:00AM cut-off will be priced on the following valuation date. What are the Turn-Around Times (TAT) for Variable Life Fund transactions? For non-Global Advantage Fund transactions, we commit to a T+1 fund price availability. For example, the Net Asset Value Per Unit (NAVPU) of a partial withdrawal transaction from the Wealth Equity Fund done on a Monday will be valued the next day, Tuesday. Is it possible to stop paying premiums on regular-pay policies? A premium holiday allows you to take a break from paying your premiums as long as your Account Value (AV) can sufficiently cover the necessary policy charges. To safekeep your investment, we recommend completion of premium payments for at least five (5) years before opting for a premium holiday. AXA generates a payment notice 28 days before your due date and a final payment reminder seven (7) days after your due date which shall be sent to your designated mailing address. If you have provided a mobile number in your application, you will also receive a text message (SMS) as payment reminder. How do I pay for my non-life insurance policy? When can I file for a claim? A claim may be filed anytime following the death, disability/injury/illness or hospitalization of the insured. Claims for riders are only possible if these are attached to the basic life insurance policy. You may file your claim immediately. Who can file for a claim? Beneficiaries named in the contract or their legal representatives, subject to presentation of required documents, can file for a death claim. Health insurance claim may be filed by the policy owner/insured. • Claims amounting to PHP500,000 and below, a duly notarized Affidavit of Guardianship must also be submitted for us to release the benefit. a) If the Guardian is the natural parent – A Guardianship Bond duly issued by the Regional Trial Court (RTC) with jurisdiction over the minor beneficiary’s stated home address must be submitted by the surviving parent. b) If the Guardian is other than the natural parent – Letters of Guardianship duly issued by the Regional Trial Court (RTC) with jurisdiction over the minor beneficiary’s stated home address must be submitted by the would-be guardian. What does "contestable" and "incontestable" mean? from the date of effectivity of the policy. suicide only becomes a valid claim during this period. What happens if the policy owner dies? If the owner dies, a new policy owner must be named. When a contingent owner is named in the application form, the latter will assume ownership. In the absence of a contingent owner, the insurance code states that the ownership of the policy will automatically be granted to the insured. If the policy is issued with an attached Waiver of Premium rider or a Payor’s Clause, on the owner’s death, future premiums may be waived up to a period as stated in the policy contract. IIE stands for Index-linked Increase Endorsement. This is your policy's automatic inflation protection feature which applies every policy anniversary. However, should you decline for 2 consecutive times, the IIE will no longer be offered the following year. What benefit do I get from IIE? The IIE gives you the opportunity and convenience to increase your life insurance coverage for a minimal premium in relation to the increase in cost of living (inflation) without the need for medical examination. How much will be the increase in my premium? The cost of increase is minimal and varies per year depending on the inflation rate. How do I accept or decline the IIE offer? By paying your new premium with IIE gives your policy an automatic increase in coverage. Should you wish to decline the offer, please reach us two weeks before your actual due date through our Customer Care Hotline number at 02 5815 AXA(292), email us at customer.service@axa.com.ph or Chat with us through our website at https://www.axa.com.ph/contact-us or you may contact your distributor. Can I apply for policy withdrawal? Yes, policy withdrawal is available for Investment Linked Policies, subject to surrender charges and submission of complete requirements. 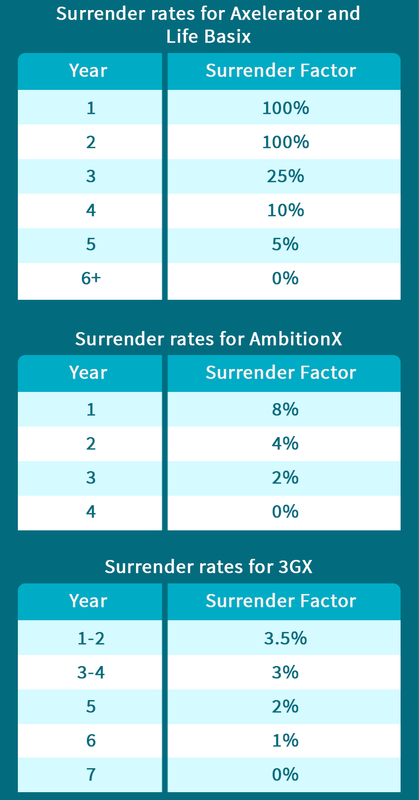 Your policy should have enough account value net of surrender charges. For partial withdrawals, a minimum amount of USD400 or its peso equivalent should remain on your account value. Note: Any partial withdrawal from a 3GX policy will cancel the guaranteed return feature of the plan. How can I apply for full/partial withdrawal? Step 1: Download and fill out the full/partial withdrawal forms. To expedite the release of the proceeds, ensure to complete the Payment Instructions Section on page 3 and indicate your complete bank account information. Step 2: Accomplish the form and submit this together with a photocopy of at least 1 valid primary ID. 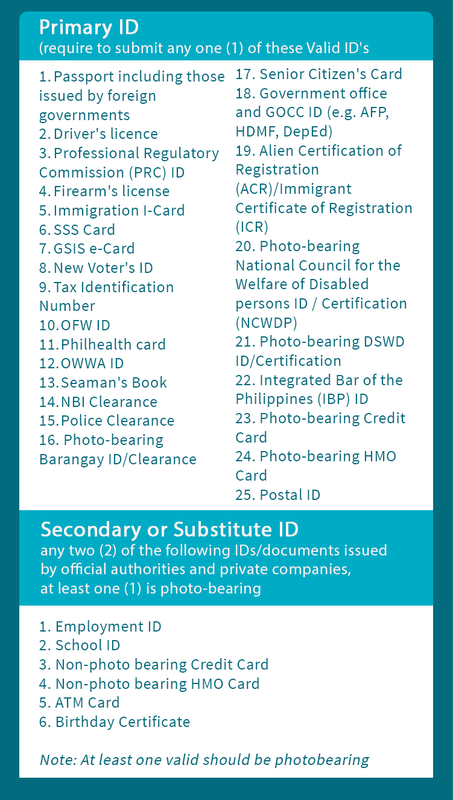 For a list of valid IDs, you may refer to table below. Step 3: If your policy has “irrevocable” beneficiaries, please have them also sign the documents with a photocopy of at least 1 primary valid ID. Step 4: Submit atleast one (1) primary to your nearest AXA branch or to your advisor/Financial Partner. AXA may conduct a confirmation call-out. To avoid any delays, ensure to provide your complete and updated contact information. Note: Please review the designation of your beneficiaries as shown on your policy contract whether “irrevocable” or “revocable”. When will I get the full/partial withdrawal proceeds? - All requests received until 11:00 AM will be processed the same day. Please ensure that the information and documents needed from you are complete and original upon submission, otherwise, processing will be done once complete requirements are received. - Please ensure that your contact information is updated as we may call you for verification. - For cheque delivery, please consider possible delays in view of the courier’sability to locate your declared mailing address. - Cheques are for deposit only. It is a request made by named beneficiaries to an insurance policy for corresponding benefits following the death or injury of the insured, according to the provisions in the Policy Contract. How can I file for a motor claim? How do i download MyAXA Assist?